The 12th International Conference of a series initiated in 1993 was held in Ukraine. 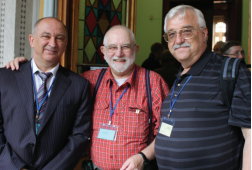 On the first day of the conference, from left to right: chair of the conference Prof. Oleg V Angelsky, Sir Michael V Berry (University of Bristol, UK) and Dr Valeriy Yashchuk (Lawrence Berkeley National Laboratory, USA). Despite political circumstances in Ukraine associated with Russia’s occupation of Crimea and a part of Donbass, the Twelfth International Conference on Correlation Optics was held on 14–18 September at Chernivtsi National University (Ukraine). Participants from Canada, China, Denmark, Finland, France, Germany, India, Israel, Japan, Mexico, Poland, Romania, Scotland, South Korea, Spain, Sweden, Ukraine, UK, and USA, contributed about 120 research reports. The number of participants was smaller than on previous occasions, lacking the usual contributions of researchers from Russia and Crimea. The main topics of the conference are singular optics; information content of statistical optical fields, including optical chaos, polarization optics, and coherence; optical correlation devices based on diffractive optical elements, including optical and digital holography, fractal optics, and optical sensors; optical correlation diagnostics, interferometry and microscopy of rough surfaces and random media; and new applications of correlation optics in biology and medicine. Graphene, a material with many fascinating properties, exhibits extraordinary optical behaviour. One specific outstanding feature is the so-called surface plasmons, wave-like excitations that were predicted to exist in the sea of conduction electrons of graphene. The wavelength of graphene plasmons is 100 to 150 times smaller than the wavelength of light, enabling very strong light confinement as well as slow light, relevant for a plethora of applications such as sensors and opto-electronics. Among invited speakers were Prof. M Berry (UK), Prof. Y Miyamoto (Japan), Prof. G Swartzlander (USA), Prof K Bliokh (Japan), Prof. S Hanson (Denmark), Prof Tim Lee (Canada); and the invitees of the OSA/SPIE Student Chapters: Prof. M Berry from the University of Bristol (UK), Prof. M Dennis from the University of Bristol (UK), and Prof. A Bekshaev from Odessa University (Ukraine). ICO contributions helped support the participation of students from the Optical Engineering Department of the National Technical University of Ukraine “Kyiv Polytechnic Institute”. The proceedings of the Conference has been published in Proc. SPIE V. 9809.